Welcome! This is my tutorial and review of MLA (MultiLoginApp). If you’re looking to manage multiple profiles/accounts on various websites anonymously, this is the go to software. It does have a few weaknesses which I will cover in this article, however, I’ve yet to find anything else out there that comes close to achieving what MLA can. 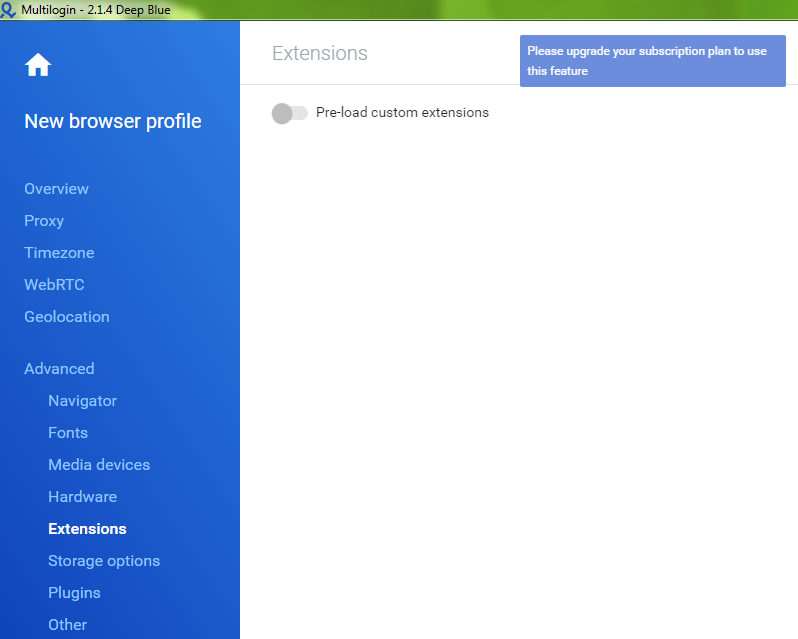 To get started click on new browser profile. Enter a relevant profile name. Operation system: I typically just leave it as Windows. However, if you’re running MLA via a different operating system, then by all means change it. Stealthfox: If you click the fox symbol and look to the right hand side under profile summary it should say Stealthfox next to browser. Stealthfox is Multiloginapp's modified version of Firefox. Mimic: Mimic is the modified version of Chrome. It's the square with a circle in it symbol next to Stealthfox. Personally, I choose Stealthfox if I need to automate with Imacros as I find the Firefox version of Imacros to be superior. Otherwise, I would probably use Mimic since Google Chrome is more popular and you’re more likely to blend in as a typical user and look less suspicious to a webmaster. 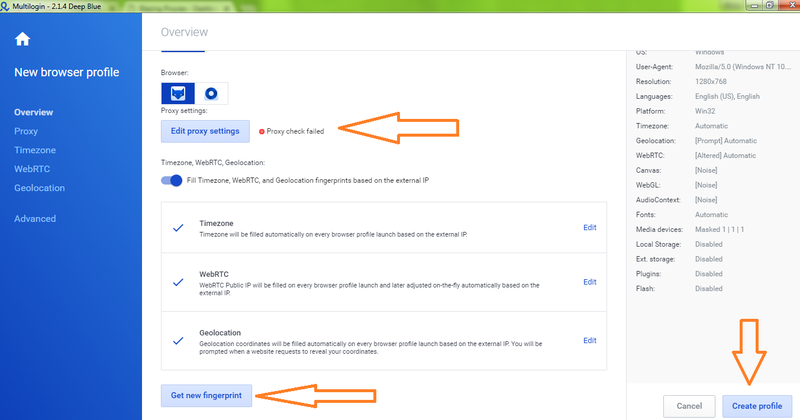 Edit proxy settings: depending on what you’re trying to achieve, it may be necessary to use a proxy. 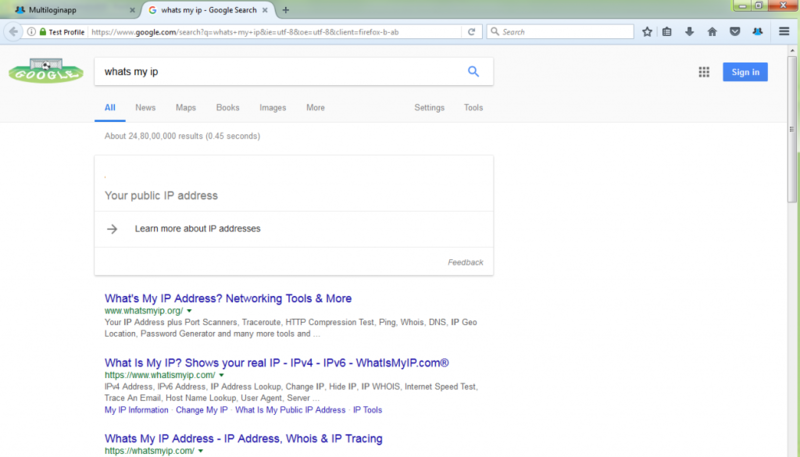 Choose the appropriate selection… For this example I will simply choose HTTP proxy. Just paste in your proxy. ​Fill time zone based on IP. 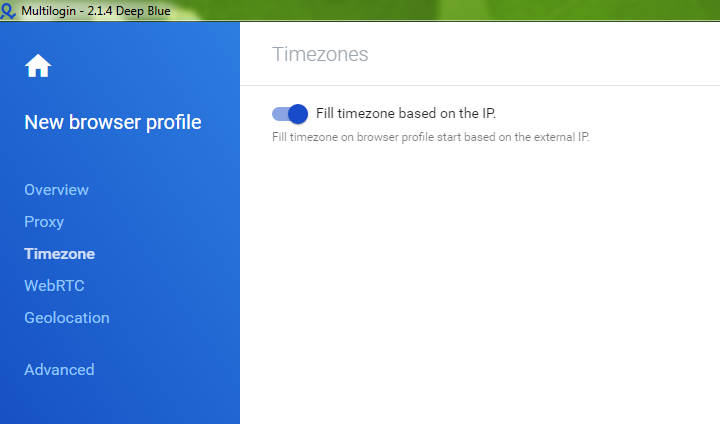 I just leave this option selected, so that the browser time zone is consistent with the time zone of the proxy used. WebRTC. Again I just leave this as default which is altered. Disabling WebRCT may look suspicious to webmasters. Also I believe the option 'Real' could leak your IP even if you’re using a proxy. So this is only recommended if you’re not using a proxy. ​Geolocation. 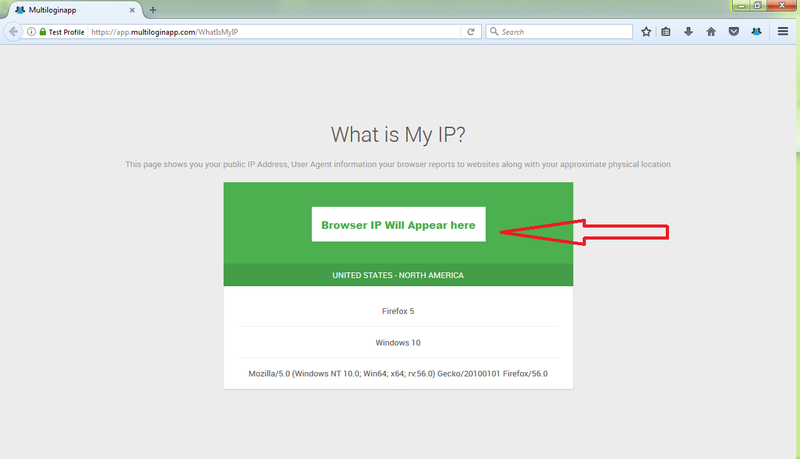 Once more, I just leave this as the default option which is prompt / fill geolocation based on IP selected. I’m not sure what harm it would do to block this; however, if you’re using a proxy it may look more legitimate if a webmaster can see both your geolocation and time zone are consistent with your proxy / IP address. Advanced settings. I tend to leave most of these as default, although I may adjust the screen resolution under navigator, if the randomly chosen resolution is too small. Also, If I’m working in Stealthfox and want Imacros to load with the browser, then I will click on extensions > pre-load custom extensions then follow the instructions that appear on screen. To do this, you need to find the Firefox add-ons / Chrome extensions online and download them onto your computer. Then place them in a folder specified on MLA. This a premium only feature, so you will not be able to do this on the free version. ​Overview. Make sure you’re happy with all your settings. It will also let you know if your proxy has failed for whatever reason. If you want a new browser fingerprint, click the button. Then click on create a profile in the bottom right-hand corner. Once the profile has been created, click on start to load it up. The browser window will load and display a Whatsmyip page to show the current browser IP. You can also check this via Google or one of many websites to confirm. 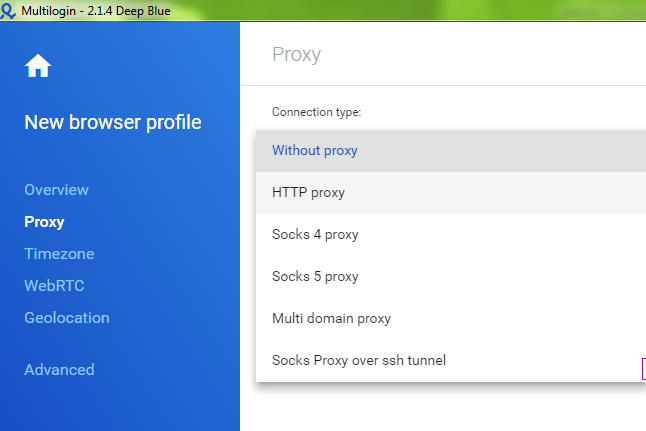 Typically, if the proxy isn’t working, you should get an error message and the browser will close so there’s no need to worry about accidentally revealing your true IP. Every profile / browser you create will look like a unique person (so long as you’re using proxies). All the cookies and history are self-contained and stored separately for each profile which is one of the main benefits of this software. 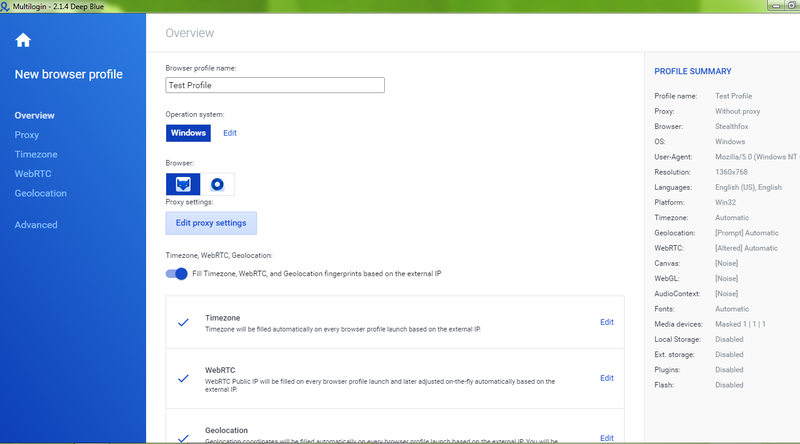 Towards the top left of the browser (first red arrow) you will see the name of the profile… in this case ‘Test profile’. This is useful if you have multiple profiles open up at the same time and they’re all on the same website for instance. You can quickly identify which profile the browser instance belongs to. When you want to close the browser window, there’s an icon to the top right-hand side which says close ‘profile name’ session. Do this instead of closing the browser in the traditional way, it will save your current tabs for when you next load the profile.